A lot of recreational runners, in this day and age, approach races, particularly the marathon, with the goal to merely finish. Orna Dilworth is somebody who broke out of this way of thinking, and has pushed herself to achievements which once seemed impossible. James Sullivan has been chatting about her background in the sport, her Irish 50K title, the highs and lows of competing at the World 50K in Doha, and what fun runners could do to really push themselves to a lot better. 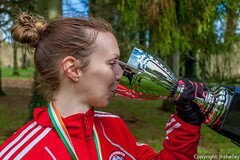 Orna Dilworth is a long distance runner from Dublin, Ireland. Having taken up the sport in her mid 20s, initially as a fun runner, she has made remarkable improvements in the past few years, with a current marathon PB of 2:57 set at the 2013 Dublin Marathon. 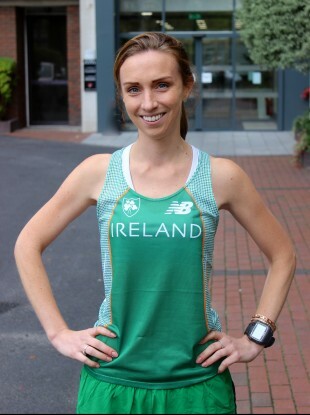 In 2014 she claimed her first Irish National title, with victory in the Donadea 50K, with a clocking of 3:43:06, and represented Ireland in the World 50K in Doha, Qatar later that year. James: Thank you for taking the time to talk to The Running Review. To begin, what sort of sporting background did you have growing up? Orna: This one won’t take long, the answer being ‘none’. Apart from the usual PE class or token school sports day, I wasn’t involved in sports growing up. I did give things a go –playing the odd match with the C hockey team or finding myself pitching for a once-off cricket game (the rules of which I didn’t even understand) but it couldn’t be argued in any way that I have a sporting background. The rare gym visit or spinning class during college probably wouldn’t count towards a sporting background either so I won’t try to claim otherwise! James: When did you take up running to begin with, and for what reasons? Orna: A couple of friends of mine were doing the Women’s Mini-Marathon in 2009 which is a historic (and possibly misleading from the name) 10K running event around Dublin City Centre. I don’t think I had ever even completed a 5K run at that stage nor did I have a particular desire to run 10K, but it seemed like a good idea and a somewhat fun way to spend a Bank Holiday Monday. I ‘trained’ for about 4 weeks, completed it in 63 minutes having walked around the 8K mark for a bit, and finished with little interest in doing anything like it ever again. 6 weeks later I joined the same group for the Race Series 5 Mile and struggled to run about 44 minutes. I swore off running at that stage and said I’d never do it again. I kept my word until the following Christmas when I decided I wanted to get fit; so I made a New Year’s Resolution to pick a Half Marathon Race and follow a training plan. I followed a generic online novice 10K plan, and then a generic online novice HM plan and around mid-May, I completed my first HM in just under 2:05. From then on, running (though not specifically serious training) just became part of the weekly routine as I picked out various goal races to keep the focus and motivation intact. James: For your first couple of marathons you didn’t break four hours. At what point, and why, did you make the decision to take the sport more seriously? Orna: I ran my first marathon in Connemara in April 2011 in 4:28. As a self-trained first timer, I really didn’t pay much heed to training paces or planned race time; and the goal was simply to complete the distance. I met people from all over the world and crossed the line with such a feeling of satisfaction and accomplishment. At that stage, I had gotten to know some people who were in the similar novice marathon boat and were planning on running the Dublin City Marathon (DCM) the following October. I picked the popular, but arbitrary goal of a sub-4 marathon and started following another 18 week generic marathon plan. By the 9th week in I was completely whacked and had to ease off. I ditched the 4 hour goal at that point and decided I’d be happy with 4:10/15. On marathon day I felt so good and fresh that I ended up running 3:53 and was elated crossing the finish line. I couldn’t believe I had even broken 4 hours let alone broken it so comfortably with the guts of 7 minutes to spare. While I didn’t have another marathon in mind at that point, it was probably around then that the goals started getting (relatively!) lofty! James: Within the space of a year, you took a full hour off your marathon time, running 3:08. What did you do differently during this time period to facilitate such a vast improvement? At what point did you realise you had a bit more talent than first thought? Orna: In the months after DCM 2011, I continued to run regularly and signed up for Half Marathons and 10K races on what was probably a fortnightly basis. I was hovering around the 1:55 mark for 13.1. I was happy enough tipping along thinking that such was my limit; plenty of people who I had gotten to know through the previous 18 months of my running were around the same level and we all just ticked over together at the same rate. I’d find a plan and follow it but there was no real reasoning to what I was doing; and I had no experience to think that I could or should be setting specific goals or training particularly differently. Around April 2012, I completed another 10K in the same time I had been running for months and, with another HM on the horizon, a discussion arose between some acquaintances far more experienced in athletics which pretty much went like this – “What are you up to? Are you happy running 2 hour HMs to high-five another one completed, or are you interested in actually pushing yourself to see what you can achieve?”. Never one to shy away, I agreed to seek some advice and actually train towards a tough but what was felt to be an attainable goal. When entering the 2012 Berlin Marathon, I would have been delighted to get a 3:30 under my belt. With a bit of guidance and focus, I got my HM time down to 1:35 fairly quickly and set a new goal of 3:15. I had a great summer’s training and went into race day with a goal of 3:12, but really wanting to run 3:10. I’ll never forget how hard the last two kilometres were but with a super course, good conditions and a lot of digging deep I managed to finish in 3:08. I guess it was the Berlin training cycle at which point things started to come together. I got, and more importantly took, advice from people who knew what they were talking about and could see my strengths in running. I committed to a plan and worked hard. I generally performed well in the long training runs and my ability (and love!) for the long distances became apparent over time. James: Last year, you claimed the Irish 50km Championship title at Donedea. Can you put that experience into words? Orna: The Donadea 50K last year had been a fairly long term goal, which was set at the same time as an important interim goal of a sub 3 marathon in DCM 2013, which I ultimately achieved in 2:57. Given that it was the National Championship with a potential opportunity to represent Ireland over 50K, it didn’t need much thought or convincing to put in the diary as a goal race. There were a number of things I wanted to get out of the race – a win/national title, to qualify for the World Trophy Race and a possible course record. Going into the last 5K knowing I was on track for all three was such a good feeling and allowed me to ease back and enjoy the atmosphere and experience. It certainly wasn’t an easy day out but to have everything come together on the day and claim the title was incredible. As someone who didn’t run or compete growing up, I still can’t describe how much of an achievement Donadea 2014 was for me and how much that gold medal will always mean to me. The hard work, commitment and focus to train and race paid off, and I was very proud of myself for accomplishing it. James: As a result of this success, you were selected to represent Ireland at last year’s World 50Km Championships in Doha, Qatar. Can you describe how you prepared for an event which was held in such oppressive heat? What were your goals entering this event? Orna: When the Venue for the World Trophy 50K was originally announced, there was an immediate flurry of panic and research into how I should prepare and train for the heat. I looked into using the Heat Chambers in the Ulster University but based on the frequency and optimal timing for this sort of training, it wasn’t a feasible option; particularly for an individual. It would have been a very costly exercise on what was already going to be an expensive self-funded undertaking. There was talk of setting up a treadmill in a shed with some fans and special heat-retaining materials but again this didn’t turn out to be practicable. I joined a gym and spent the odd lunchtime in the sauna as well as setting up my bike on the turbo trainer and doing a few sessions in the spare room with the heating on. Unfortunately when you’re training for a 50K race and working full time, the majority of available time has to be spent pounding the pavements and not in the luxury of a heated atmosphere. We were advised of the temperatures and conditions as they had been for the previous three years at the time and date on which the race was to be held, and the indication was that it wouldn’t be as hot or oppressive as initially expected. Seeing as we had such a nice summer in Ireland and I had done some long runs in the heat, I wasn’t as concerned as I possibly should have been. I did get away to Spain for four days but on the day I had the most important run (a 24 mile run in the midday heat), it lashed rain from 11am to about 3pm! It was about four weeks out from the race when we really started to get concerned that the temperatures in Doha were not coming down as expected – there is nothing like reports of ‘unseasonably hot weather’ in the Middle East to get you worrying about training, ability, race tactics etc. While I would maybe do things differently in the future, it was a learning experience and I did with it what I could based on the Irish climate and my limited options and resources at that time. James: Can you talk us through the race itself? To what extent did the heat affect you? Orna: Thirst. That is my overwhelming memory of the entire race in unbearable heat. From a couple of kilometres in, I simply suffered an unquenchable thirst. That was so alien to me as I would (perhaps foolishly but not intentionally) rarely take on more than a minimal amount of fluid on my long runs. It was 10 laps of 5K with 2 water stations and a personal aid station on the route. I was throwing a bottle of water over my head at each one and gulping water and sports drinks (sometimes spitting it out but just needing to feel cold fluids) like each mouthful was my last. I was running by HR but with the temperature fixed at a horrendous 36 degrees, I couldn’t run the pace I had trained for at the rate necessary to ensure I could complete. That, on top of all the fluid I was taking on just made it impossible to think about a fast time and when I was struggling from 15K (at which point I should have been flying) it came down to a survival/finish goal. The heat was dreadful but I was wearing the Irish vest and I knew that if I just continued to manage everything and accept the way it was going that I would finish proud. Even though everyone was in the same boat, I take consolation in the fact that I was the most inexperienced competitor and probably the only lady who, if not native to extreme climates, had never raced in extreme conditions. Suffice to say the heat added about 45 minutes onto the time I had trained to run which meant not only was I disappointed with my time, but I ended up being out in the heat for far longer than I’d spent on my feet in a quite a long time. James: Can you describe the recovery you had to go through in the hours and days following this race? Orna: I talked and cajoled myself through the final 5K with promises of an ice bath and a bottle of Coca Cola (indication number 1 that I wasn’t myself as I never drink that). I crossed the line delighted, with my hands in the air asking for a drink. By the time the drink found me, I couldn’t even look at it and felt so nauseous. All I wanted then was to be horizontal in fresh air; fresh air being an unavailable luxury out in the Doha dry heat. As I had taken on so much fluid, I wasn’t dehydrated as such but I hadn’t metabolised it all, and it was just sitting in my stomach rather unpleasantly. It all came up and I ended up on a drip in the medical tent. I discharged myself three times thinking that I was fine and just wanting to be in bed in the air conditioned hotel room. Unfortunately, while my mind thought I was fine, my body had other ideas and I was fairly weak. I have no sense of the timing but I understand it was the guts of 2 hours before the doctors were happy to let me go and so I made a deal that I’d stay in a wheelchair and let the medics bring me to my hotel room. I was still really thirsty but I wasn’t allowed to drink much. I had to beg to be allowed sip a bottle of water for the night. Once I was over those immediate few hours, I actually recovered really well. I had an enormous feed the following morning and rehydrated over the course of the day. As the race pace had been so slow, the body was only ‘Long Run’ fatigued and not ‘Hard Race’ sore so the recovery from that point of view took no time at all. James: With the benefit of hindsight, are you pleased with how you performed on the day? What are the major positives you have taken from your international debut, and what areas can you improve on going forward? Orna: I was pleased in the immediate aftermath but was extremely disappointed in the 24-48 hours afterwards. Thereafter, and following the usual in-depth post-mortems and speaking with various people I have managed to put it in perspective and be at peace with how the race went. I’d be lying if I said I was ecstatically happy with the race itself, but I am proud of the performance I put in and I have to accept it was the best I was capable of on the day in extremely tough conditions. I think I have unfinished business with the 50K based on how hard I had trained and what I know I had in me had the race been in better conditions, but who knows when I’ll dust off the gloves to fight that one. In terms of the experience, the entire event – from qualification, through training, tough race included – is up there with one of the best things I’ve undertaken and achieved. Six years ago, I couldn’t run to the corner, now I have an Irish vest and have represented the country at a top event among about 20 other nationalities. I got exposure to, and advice from, some wonderful and amazing athletes. I have seen what’s behind the results achieved by girls (and guys), which results I can only dream of, and the talent and hard work that contributes to all of their successes. Whilst many of my fellow competitors are of a level I’m not sure I could ever reach, the whole occasion gave me an appetite to work hard to continue to achieve what I probably wouldn’t have even considered possible before. James: A growing number of international sporting events are being awarded to Middle Eastern countries in general, and Qatar in particular, with the 2019 World Athletics Championships being recently awarded to Doha. Do you think it is right that sporting events, particularly endurance races, are held in a place with such inhumane temperatures? Orna: The facilities in the Middle East, particularly the Aspire Zone in Doha are absolutely fantastic – from the sports facilities themselves to the supporting healthcare and accommodation centres. There are plenty of indoor amenities (from football pitches to running tracks) and the investment and interest in sports is such that some countries couldn’t begin to wish for. It’s such a shame that the climate is so cruel; and yes, by the very nature of things, the impact on endurance athletes is greater. A lot of the ‘inhumane’ discussion has to depend around the time of year on which certain events are held. The World 100K was held about a month after the 50K and temperatures had dropped to what would, in many places, be akin to a balmy summer’s day and the suffering of the athletes didn’t appear to be anywhere near as severe as that in the 50K. I understand quite a bit of the detail surrounding the World Cup and the 2019 World Championships has yet to be finalised but I’d like to think that it is all arranged in the athletes’ favour as much as possible. I guess that all countries have the right to bid for these events and put the necessary facilities in place; thereafter it’s for the organisations to decide on the appropriateness or otherwise for the competitions in question. James: What do you believe to be your greatest strength and weakness with regards to athletics? Orna: Hard work and focus having committed to a goal. I have some bit of talent in what’s been referred to as my ‘solid diesel engine’ but I’ve had to put in the actual work to capitalise on that and I don’t suspect natural talent can survive in a vacuum. Another strength is my loose-cannon- “I’ll-try-anything-once” attitude. This attitude had me in the very entertaining position of being in the blocks for a 200m track race last summer. The girl who won crossed the finish line before I was even upright. I was so outside my comfort zone and athletic ability but I had nothing to lose and everything is worth the experience. In terms of weaknesses, I suspect I have a lack of general athletic experience and knowledge in terms of what one might pick up ‘on the circuit’ growing up. But there are always people happy and willing to advise when I have questions to ask, which some might say is a painfully regular occurrence. My major weakness is my lack of speed / dread of speedwork / inability to cope with lactic build up. I do not have the strength or leg turnover over the shorter distances and while I put in the hard work and commit to everything for the longer distance, I find it very difficult to get stuck into speed training. It also takes so much more out of me and I struggle to recover, which in turns leads to me taking breaks and losing focus. James: What are your goals for 2015? Orna: I have two – 1. deal with the MAJOR weakness noted above, and 2. run a marathon PB. Number two depends on the success of achieving some results with number one though, and may have to be postponed until 2016 if I don’t get to where I want and should be over the 5 & 10K distances. James: What is your ultimate ambition in the sport? Orna: Extremely difficult question. Ultimate ambition would probably be something over marathon distance. So, had you asked me that 3 years ago, my answer would have been ‘a 3:30 marathon’. 2 years ago, it would have been ‘a sub-3 marathon’. At the moment it’s a lofty sub-2:50 marathon which I’m miles off right now. However, if I do achieve that, the goalposts will probably move again. Who knows what or how long I have left in me. Orna: Favourite would easily be a long run with a pal on a lovely sunny afternoon. I dislike anything speed related. Although in fairness that’s slowly changing and I’m currently quite enjoying good sessions of 400s. Least favourite is probably 1-2mile repeats which, which I have to confess, I probably need the most but continue to shirk on. Interesting that the least favourite sessions would probably boost my confidence and satisfy me more once under the belt. James: Your PBs over the shorter distances, and the half marathon, do not match up with your performances over the marathon and 50km. What sort of speed based sessions do you do to try address this? Orna: It’s the overwhelming obvious chink in my athletic armour. I think I’m one of a small minority who has a sub 3 marathon off the back of a 1:25 HM PB. Part of it has to be that I took up running in my 20s for fun. I’m not saying that it’s not good to enjoy one’s running but I never really focused on club or speed training. My shorter distance PBs are soft, but it still terrifies me to even think about how I’m going to beat them. I have recently started doing sessions but it will take some time for the fruits of that labour to show in the results lists. There are generally 3 prescribed sessions per week but I’m not able for that just yet so I’m trying to do a session of 400s once a week and then either longer reps of 1mile/2k or a hard tempo as a second session. Plus a longish run at the weekend, because that’s what I like and what is important to me in the long run. James: Being somebody who has run several slow times before committing fully to the sport, do you believe there is a lot of wasted talent out there in the recreational running community? Is there too much backslapping these days with regards to merely finishing a marathon? What should be done to get more of these people into a club environment, and striving to be more competitive? Orna: Yes. And yes. Don’t get me wrong, getting to the start line of my first marathon in the 18 weeks of 10+ minute mile training and subsequently completing it in the 4 hours, 28 minutes are memories I’ll never forget. You never get your first marathon back and that sense of satisfaction has to be embraced and enjoyed. That said, the single best thing that ever happened to me in terms of my running was being called up and challenged on my approach and what I was happy to ‘just achieve’. I would still (probably quite happily) be running 2 hour half marathons had I not taken the advice and guidance on board and pushed what I thought were my limits; but having come through and with first-hand experience, I can 100% say that I am happier now looking at how far I’ve come and knowing now that I am capable of running times I would never have thought to be within my reach. For anyone who’s willing to see that there’s more than just a finisher’s t-shirt available to the masses; there is so much to be gained from deciding to work hard and go after something better. I think events such as Parkrun and BHAA races are super opportunities for people to get the taste for the next level of competition (outside of completing commercial run after commercial run), but before stepping into what might be perceived as the scary level of club runs. A lot of clubs also have very beginner-friendly leagues such as the Ladies Meet & Train and the Fit for Life Rounds. It’s about breaking down that perception that ‘racing’ or running hard is for club runners or elites and not for the fun runner on the street. There are plenty of people, sports and athletic clubs, work clubs etc willing to give good advice but people also have to be willing to listen to it. I’ve been given some not so gentle encouragements over the past few years – not particularly fun to hear, but without which I wouldn’t be where I am now. James: Do you ever wonder how good you might have been had you been involved in athletics from an earlier age? Do you regret not taking up the sport sooner? Orna: Yes and no. I have wondered where I might be or what I might be capable of had I been involved from an earlier age but I don’t go beyond a fleeting thought on it – there’s no point in me tormenting myself with the shoulda-woulda-coulda of my running career. And torment is exactly what it would be. The fact is that I wasn’t; and while I could possibly have been a super juvenile sprinter (I find that a hilarious and incredible thought! ), I could also be plagued with legacy injuries or absolutely hate athletics now. I can’t have any regrets because it’s not something that was specifically on the table for me, nor was something that I walked away from and came back to. I took up running at a time that suited me, when the motivation to train and race was something I just possessed and wasn’t imposed on me. It’s never been a chore and with that I’m very content. On a similar side note however, I suspect I would have regrets in the future if I didn’t see my current goals or potential through to the next level. James: That’s great Orna. Thank you for your time and the very best of luck in 2015. Orna: My pleasure. Thank you for allowing me the opportunity to reflect, which has been an enjoyable and worthwhile exercise for me.